The Jimmy Carter Peanut of Plains, Georgia, is a reminder of a kinder time in politics. In the 1976 presidential election, Jimmy Carter won his home state of Georgia in a landslide victory, with every county in the state voting in his favor. Some would attribute his victory to his local appeal to Georgians or his status as a Washington outsider, but a 13-foot peanut in Carter’s hometown of Plains might have played a role as well. Both peanuts and Jimmy Carter can be found all throughout Plains, Georgia, but only at the Smiling Jimmy Carter Peanut do the two come together. Standing at 13 feet tall and complete with a cheesy grin, this peanut was built by the Indiana Democratic Party to campaign for Carter’s 1976 bid for the Oval Office. 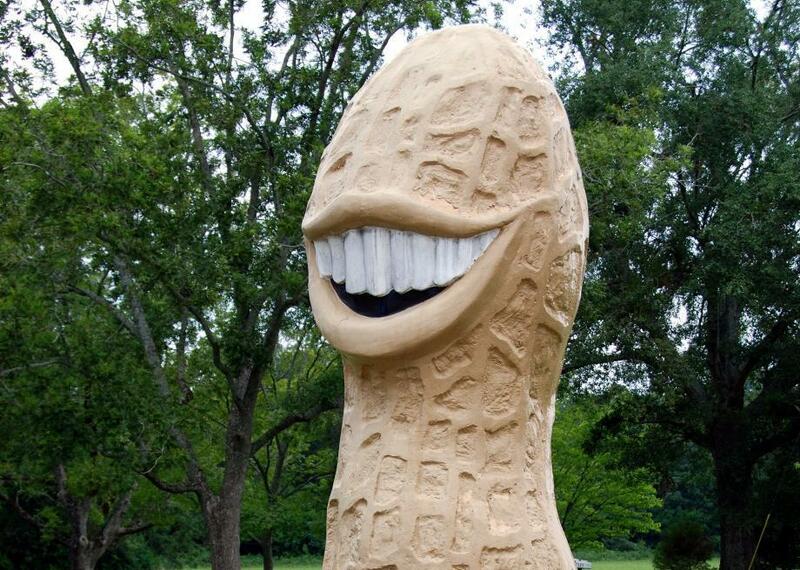 The Indiana Democratic Party realized that peanuts had a local appeal, so its nut of choice for the monument was a giant goober, creating a connection between Georgians and Carter, a former peanut farmer himself. They even gave the peanut a smile, intentionally reminiscent of the toothy grin that won Carter millions of voters. In the end, the goofy peanut gimmick paid off. Carter won his home town of Plains and every other county in Georgia, propelling him to a victory against Gerald Ford. Since 1976, the Jimmy Carter Smiling Peanut has held its position as the world’s second-largest peanut, “the most photographed thing in Plains,” and one of the oddest monuments to a politician anywhere in the world. Unfortunately, in 2000, a reckless driver crashed into the peanut, whose wooden hoops, chicken wire, and aluminum foil weren’t enough to keep it upright. After the accident, the peanut was moved from the Plains train depot to the Davis E-Z Shop in Plains, where it remains today. Although the peanut has been kept in pristine form, the fence surrounding it has become dilapidated as a result of over a decade of tourists posing for photos on it. Perhaps the most interesting feature of the peanut, however, is its back, which has a sizable hole in it. According to local legend, the hole was carved by the Secret Service in 1976 to ensure that there were no assassins or bombs hiding inside the grinning goober.